Psalms 82 reads - God standeth in the congregation of the mighty; he judgeth among the gods. How long will ye judge unjustly, and accept the persons of the wicked? Selah. Defend the poor and fatherless: do justice to the afflicted and needy. Deliver the poor and needy: rid them out of the hand of the wicked. They know not, neither will they understand; they walk on in darkness: all the foundations of the earth are out of course. I have said, Ye are gods; and all of you are children of the most High. But ye shall die like men, and fall like one of the princes. Arise, O God, ajudge the earth: for thou shalt inherit all nations. What does this scripture mean to you? What is the scripture “Ye are gods” referring to? How about “Ye shall die like men”. Though there are different views on this scripture, let us go over one at this time. As we all know God with a capital “G” is God almighty, our father in Heaven. He is the God that judges all, but what or whom does the bible refer to when it speaks of god with a smaller case “g”? Within our great country and the world we have those that are giving the authority over us. These people being in positions such as Judges, congressman, president, and so on. The term “god” with a smaller case refers to these individuals. They have the power and authority to create laws, and enforce laws, and also to judge when those laws are broken. that accrued during the times of this author. Though we have many great Godly lead men and women in power, we sadly have many that are not so godly. This scripture cries out about the power these men and women have, and to the fact that many are failing in their duties. It reads - They know not, neither will they understand. I believe many in authority don’t understand the repercussions of their actions. They have no moral standard to base their decisions on, and thus make decisions based on only human intellect, and feelings. Towards this notion, the Bible reads in – Jeremiah 17:9 - The heart is deceitful above all things, and desperately wicked: who can know it? Meaning...if we based decisions on what may feel right, it sadly may very well could be wrong. The author sees this abused power and the suffering by those depending upon their elected leaders. Suffering that need not be, and sadly seen by many as not important by those corrupted by evil. Can we relate this scripture to America today? 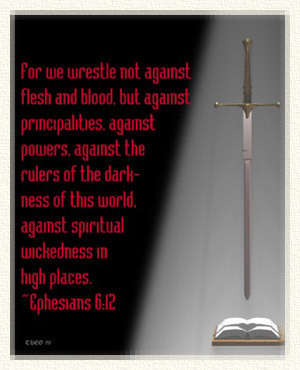 Are there those in power, that don’t realize the power and impact they hold, or could in fact, it be what is spoken of in Ephesians 6:12 when it reads - For we wrestle not against flesh and blood, but against principalities, against powers, against the rulers of the darkness of this world, against spiritual wickedness in high places. Evil has found its way into our system of governing. By ignorance of God’s Word, we as Children of the Most High have failed to protect, guide, and serve as those led by God, the Father. Let us sound the alarm today, unite in our common interest, laying down foolish arguments. We know what must be done; now we simply need to do it.